VIAe Cigs is yet another newcomer to the electronic cigarette market. However this one is backed by industry experience that dates back to 2008. Based in Charlotte, NC, VIAe offers one of the lowest costs of entry in the industry, with their starter kits priced as low as one pack of cigarettes. This is about as good as it gets in the cig-alike market on an extremely low budget. VIAe Cigs offers probably the lowest cost to entry at just $7.99 for one rechargeable battery and cartridge. You will, however need to shell out an extra ten bucks for a charger, or grab one of the starter kits for $14.99. Note: VIAe Cigs is no longer available as they have discontinued their line of ecigs. Please refer to our list of the best e-cigarettes or check out our reviews on the more reliable ecig brands such as V2 eCigs, VaporFi, or Green Smoke. 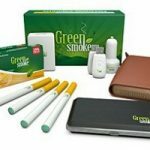 The ability to save money by switching from smoking is one of the key selling points of electronic cigarettes, in addition to their harm reduction. On their website, VIAe Cigs has starter kits ranging in price from just $7.99 on up to only $14.99. They also offer affordable cartridges in three nicotine levels (0, 1.2% and 2.4%) and disposable e-cigarettes. Much like the Cigavette Starter Packs, VIAe's two-cartridge kits come in a box almost identical in shape and form to a pack of smokes. They are much more vibrant, however, with an image of the VIAe ecig and logo on the front with a white background and foreground colors representing either tobacco or menthol and its respective nicotine strength. Refill cartridges are sold in boxes of five, and are about the size of a deck of playing cards. Inside, cartridges are individually sealed in a plastic case and wrapped by a foil, similar to a pack of gum. The cartridges themselves, look about as close as it gets to a cigarette filter. They are wrapped in a dark orange tape with lighter orange speckles and a colored ring around the end, corresponding to their flavor and nicotine strength. The only branding on the entire e-cig is a VIAe logo on the colored ring. Batteries are solid white, with no cigarette-like rings or printing of any kind. The tip is red and glows almost pink when in use. Sadly, VIAe cartridges only come in traditional tobacco and menthol flavors. Like most e-liquids, they use a blend of propylene glycol, vegetable glycerin, flavoring, water and nicotine. On the bright side, their tobacco is one of the best tasting I've tried yet! It is incredibly smooth and smokey and doesn't have that fake sweet taste many others have. The menthol option is pretty standard, closely resembling a Newport cigarette with a hint of sweetness. What VIAe Cigs lacks in flavor and nicotine options, they make up for in a smoke-like experience. Of course the 2.4% is going to be a bit stronger than the 1.2% cartridge. In my opinion the former has a bit more of a leafy taste but a more cig-like feel. The latter is a bit smokier and much smoother. Both provide a substantial amount of vapor, relative to the size of the VIAe device. The battery life on these little e-cigs is pretty phenomenal. VIAe states they have up to 5 hours of use, which is more than double most other batteries in their class. I was able to get through nearly an entire weekend of moderate vaping on one battery. Charge time is somewhere around 2 hours, a bit longer than some, but with how low the price is for the single cartridge kit, you can easily have a second one to use while charging. Note that the single cartridge kit does not come with a charger. For quite possibly the lowest entry cost on the market, you can get started on vaping with a VIAe Cigs starter kit. We would recommend the kit with two cartridges, since it comes with a charger. Their cheapest kits are essentially the lowest priced replacement battery I've seen, at only $7.99 for a battery and "free" cartridge! At these prices, I wouldn't have expected the VIAe to deliver much, if any, performance value. However, it offers pretty much one of the closest experiences to actual smoking that I've felt from any electronic cigarette. It would be interesting to see what kind of flavors VIAe Cigs could come up with if they were to try, considering they really hit one out of the park with their traditional tobacco cartridges. Great price, decent vapor and taste and it looks like a real cigarette. Yep..you have my attention. Now….How do I find these folks to make a purchase? Can’t fine their website.